Charlotte’s Family Orchard for many years has been the top winner of fruit exhibits at the Queens County Fair. For the last two years we have been the winner of the giant pumpkin contest at the local fair and the Fredericton Exhibition. We specialize in our U-pick operation of apples, pears and plums. We also welcome farm tours such as school visits. We are members of the New Brunswick fruit growers association and licensed as a New Brunswick apple producer. 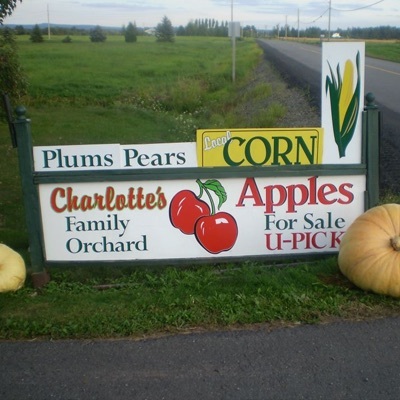 Charlotte’s Family Orchard has been in business for approximately 28 years and grows over 30 varieties of apples including the ever popular honeycrisp. We take pride in growing healthy produce, and do so with on-farm safety. We practice integrated pest management (IPM). We take special care in growing and handling our products. All our products are locally grown. U-Pick apples, pears, plums, and cherries. We also sell vegetables in season, fresh locally grown in New Brunswick; corn, squash, potatoes, blueberries, wild cranberries, and other seasonal vegetables. We offer for sale homemade jams, jellies, preserves, pies, and apple cider. We produce jack-o-lantern pumpkins, pie pumpkins, and award winning giant pumpkins.